White dishes are the little black dress of our kitchen cupboards… they are right for every occasion! I’ve had a love affair with them for years! They are always in style and go with every other dish you have! I’ve discovered so many wonderful things about white dishes and amazing ways to use them! 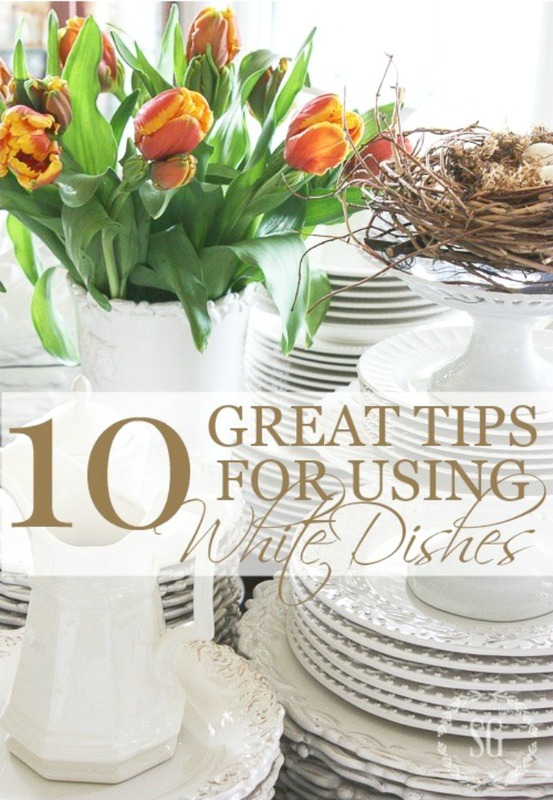 Here are 10 great tips that will make you love and want to use white dishes too! Here are my top 10 tips for using WHITE DISHES! Every style, season, holiday, occasion, fashion, and decor! They love to work and play with other dishes and patterns! They are the Miss Congeniality of the dish world! Use them in every table! BUY WHITE! 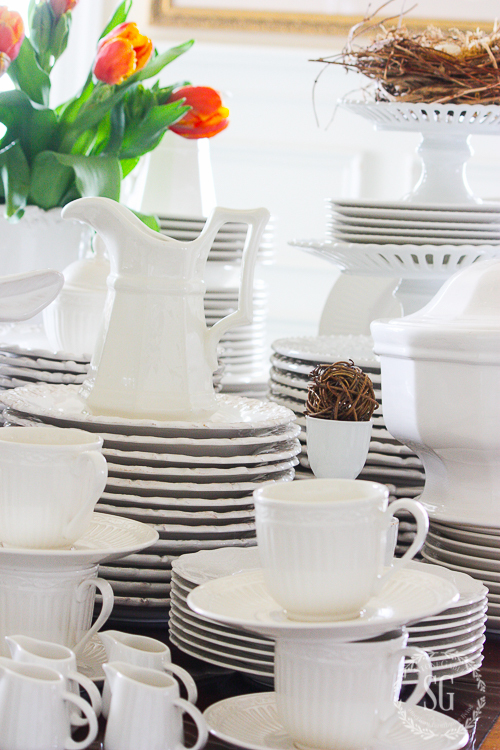 IF YOU BUY ONE SET OF DISHES… BUY WHITE! I call my white everyday dishes “the workhorses of my kitchen”. I collected my 18 sets of Mikasa Italian Countryside over a couple of years. They still look as good as the day I bought them. You can find my dishes HERE. Collect one style slowly. I suggest at least 12 sets but prefer 18. I use them in so many ways! They will become the backbone of most of your tables! ONLY COLLECT WHAT YOU LOVE! I have dozens of styles of white dishes. I collect what I love… and because I love them, I use them! My favorite places to find dishes are TJ Maxx, HomeGoods, Pier 1 and Marshalls. They have gorgeous dishes but usually, don’t have large quantities… and that’s OKAY. Last week I found 5 square white dinner dishes with little ball edges. I literally skipped out of TJ Maxx hugging them! I mix and match white dishes. So a few of one pattern or another makes a very lovely tablescape! Notice (below) that I only have 5 white bowls in this frilly intricate pattern. But when I add another 5 white bowls in one or two other patterns, they look so charming together! So don’t worry about collecting 8,12 or 18 of any other white dish pattern! If you find even one you love… buy it! To me, white dishes are all about the edges. They bring interest and life to white! Texture is very important when it comes to white! Not only are white cups and saucers pretty to drink from, but look wonderful stacked in a hutch or cupboard. 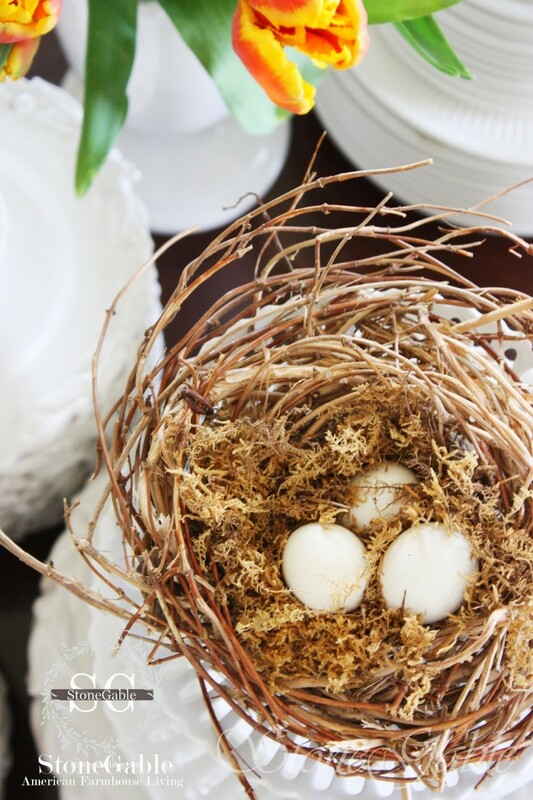 They are great filled with flowers for individual centerpieces at each place settings and are perfect for sweet little nests and pumpkins. There are so many uses for white cups and saucers! Of course, white cups and saucers are my very favorite! Swoon-worthy! 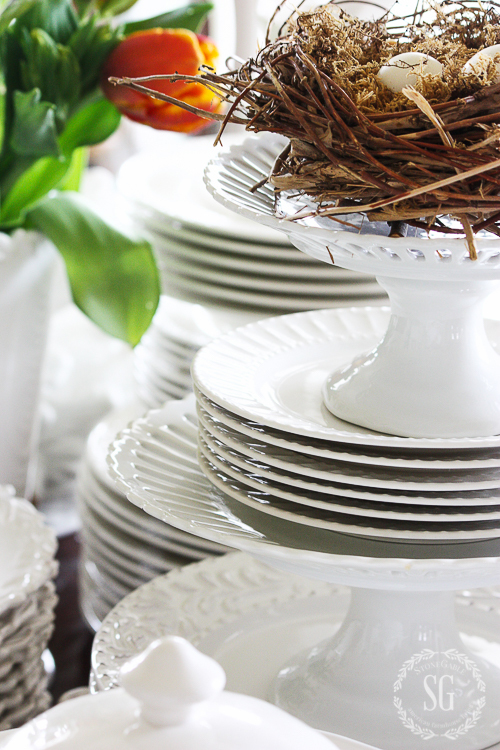 White dishes were made for stacking! No other colors make such beautiful towers! 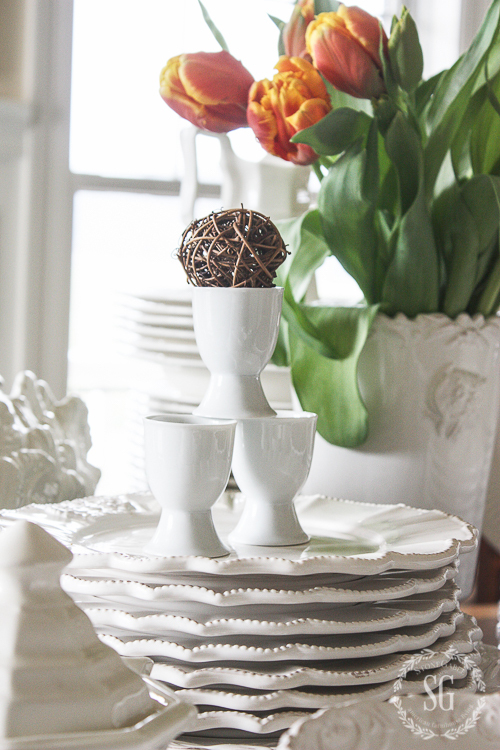 Take them off the table and use stacks of white dishes to decorate tables, coffee tables, buffets, dressers and any other surface in your home! Egg cups, pitches, creamers, sugar bowls, serving pieces, large bowls, cake stands, pedestals, vases… You can count on finding great white pieces! White dishes are a great investment because they are a classic. A 30 year old white ironstone looks amazing with a sleek and modern white porcelain serving dish! Food and white dishes are made for each other! Food always looks more delicious on a white background! 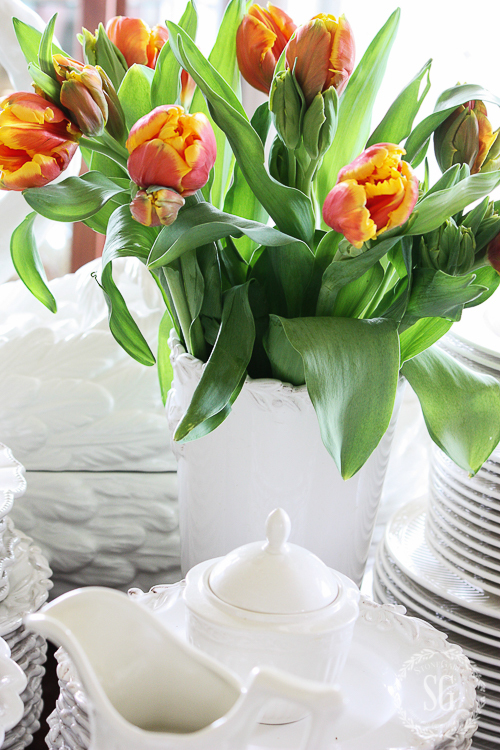 And what is prettier than a white vase and dishes with colorful flowers? Do you love white dishes yet? Do you have a great tip or an interesting tidbit about white dishes? Please share! Does it matter if the white doesn’t match, or does the off white and pure white compliment each other so you don’t worry about it not matching? I have a collection of white dishes, platters and several tureens. I also have a ginger jar with lid with the letter m and a crown on it, of course I need an H. Any idea where to find monogrammed pieces? Let me give you a fun tip. You can actually have plastic monograms made for you on ebay and then put them on your plates you are not using. Oh, boy, now I’m on the deliciously fun hunt for white dishes! I love the look – and I especially love that you can mix and match patterns. How fun is that? My question is, though, do you ever use square dinner plates with round dinner plates on the same table or is it best to stick with one or the other? And I’m hoping that different shades of white would look lovely, too, because it’s impossible for them to all be the same shade of white. Using square and round dishes on the same table is beautiful! Just set one place with square and the one beside it with round dishes. And mixing hues of white is also lovely! Just make sure you have about the same percentage of white hues going on at each place. Hope this helps, Penny! You’ve convinced me to collect white to compliment my blue and white! Thanks!! I have been using white dishes for the last 30+ years. Love them! I gave my first set to my son and bought another for myself that I have had for years. Mikasa French Countryside. I am missing pieces but instead of buying a new set, I will just start adding other white pieces. And – food does look better on white! Great post! I wish I had started a white dish collection when I first married 50 years ago. I have Fiesta-ware and I love the bright colors but I think I will begin a collection of white to ix-in. Thanks for the idea! Love, love, love your white dishes! Your influence has been great! You’ve got me ordering white dishes! Just ordered two mismatched sets from Macy’s, and have one set I ordered earlier from Restoration Hardware! 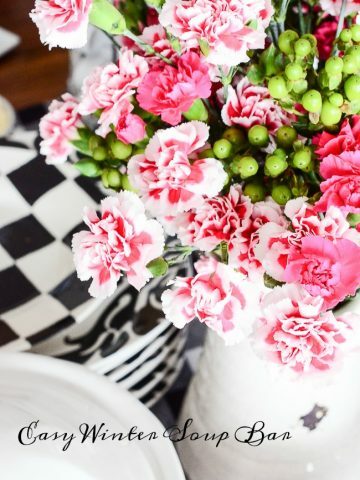 You are so right–they add such a lovely touch to table and home! Started our marriage with Heritage by Pfaltzgraff nearly 28 years ago! Have only added to it and now can’t even think about other plates or colors! I’ve just started my collection! Thanks for the ideas! I couldn’t agree more about the white dishes. I have had mine for 30 years and still use the, every day! Villery and Bach Manior. I try to persuade young a brides to pick something white but many of them don’t understand. Love my white dishes that go with every season! 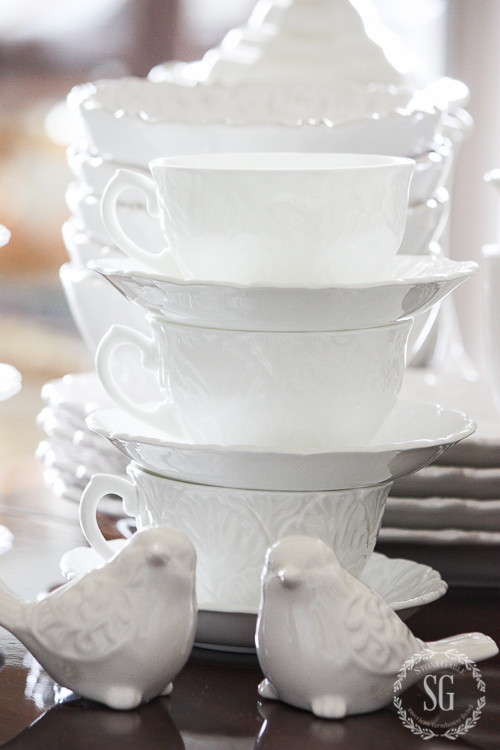 Your white dish collection is beautiful! I have a nice collection of antique pitchers, creamers and soup tureens that I really enjoy. I bought my white set of Buffalo China 10 years ago and still am enjoying them. Thank you for sharing. You have inspired me so much, Yvonne! I am at a stage in life where I long to create a beautiful table for special occasions, but I am starting from scratch. At Christmastime I was so excited to purchase three beautiful red tablecloths but was saddened to have to put “pretty” white paper plates on them because nothing in my cupboard looked any better. My goal for next Christmas is to build a beautiful collection of white dishes and maybe even some new silverware. Any suggestions for a newbie like me? I’m thinking of accumulating varying sets of four just to keep it interesting but am wondering if it would be wiser to build one solid set first and then add to it. We had 20 people at Christmas, and I’m just not sure I would even want 20 of the exact same thing. I would LOVE, LOVE, LOVE to hear a podcast about advice for a newbie like me! Thank you so much for sharing all your wisdom with us! Hi Jackie, not sure when this post was made, but if you are still on the hunt for flatware, I would suggest that if you purchase stainless, you make sure it is 18/10 grade. This is the most durable and will last forever. You might also consider purchasing them in sets of 6 so that two sets will work with a 12 piece set of plates. While there are some sets sold by place settings, I have found that Oneida sets of 18/10 are the most durable and last forever. Hope you are enjoying stocking your kitchen! Your collection of white dishes is lovely. I adore the variety of patterns that you have collected…simply stunning. 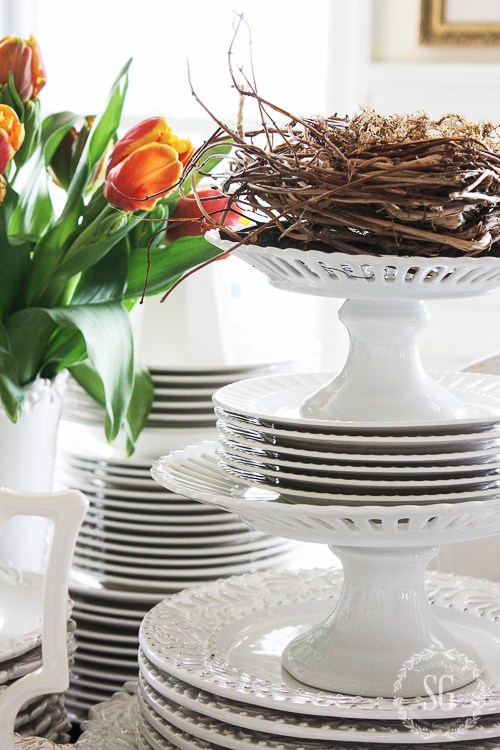 White is always so versatile, elegant and sets a spectacular table for any occasion. Thank you for sharing. Love the white dishes too! So bright and cheery! 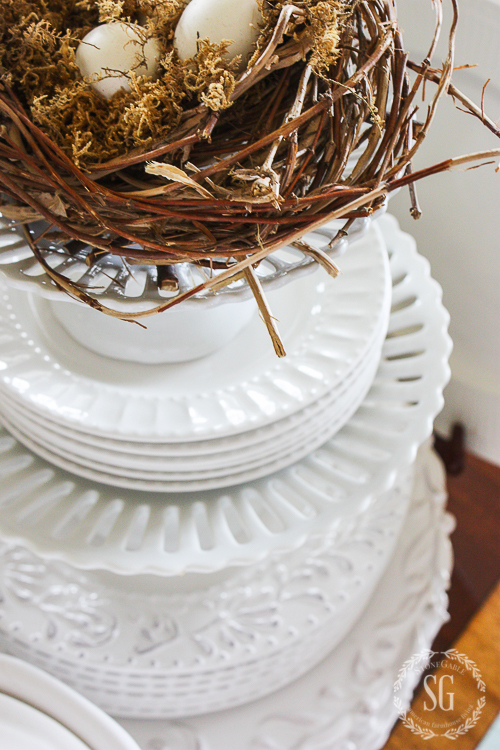 I also love to decorate with the things that I love…pitchers, birds, seasonal flowers. Normally I donate, but today I was shopping with my son at thrift stores for his new apartment and was surprised to see how many beautiful dishes they have for sale at very cheap prices! I love the white dishes too because it IS so versatile, you can easily change things up by adding new colors. Also, your great reminder; “Don’t overspend!” Thank you for the great ideas that you share– everyone can afford their own version of your wonderful designs! love love white dishes. Where can I get the white bunny soup tureen? I don’t know how I missed this post. I love white dishes too. They just add something to a table. White dishes are a classic. Any food served on them just looks delicious. Very nice. We also love to use white dishes in our home. Your dishes are beautiful! Thanks for sharing!!! Not only myself but all my grown kids have a set of white dishes! So many uses as you point out. Easy to be seasonal! I loved the part about you skipping out of TJ Maxx hugging them. It comforts me to know others get that worked up over great decor finds at TJ’s! You’ve inspired me to begin my 2017 hunt for square white dishes. I adore square dishes. I have NONE. I’m working my way toward my gray/white addiction that began nearly two years ago in our lake house. Many shades of grays and whites — “swoon worthy,” as you’d put it — and it’s PERFECT. And therefore the square white plate hunt is a must. Oh Yvonne, your white dishes are so beautiful… Thank you for mentioning mixing and matching, that is such a great idea. I remember when I was 13 my mother asked me to pick my china and crystal so she could begin adding to my “hope chest”. I chose all white with a gold edge because even at that age I knew the patterned dishes would limit my options. To this day I am in love with white dishes. Though I may not need more every time I’m in TJ Maxx, Homegoods, or Marshalls I am drawn to the white dishes section. Yay!!!! My everyday dishes for the past 15+ years are white. They are so adaptable; I’ve acquired a nice collection of various table lines and accessories that easily change their look. Always enjoy your posts, and I always find new ideas. Very classic style. So glad I found your blog. Great Inspiration! I can so easily echo what others have said about white dishes! Several years ago at an auction, I had the opportunity to purchase a six-place setting, plus platter & cream & sugar of white ironstone! It was a great deal that day. 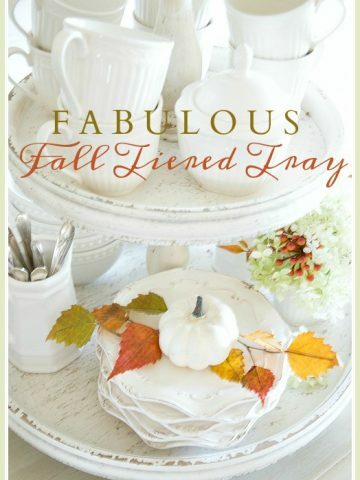 I have since collected 4 soup dishes in another white pattern, 12 appetizer plates, 6 fruit bowls — all in white or cream. I love to mix & match with my other china. I also see them at thrift shops, and nicer re-sale shops. You just gave me permission to collect more! Have had my white dishes over 25 years and have never tired of them. I am now doing my research for a new set and can’t wait for a fresh new look. Great post thank you! I so agree. I love white dishes and feel like they never go out of style. However, you have inspired me to add to my collection. As I type, I am also checking out on a purchase from one of your links. 😉 Thanks for all the great advice. Based on your recommendation I got my Christmas wish last year of a set of Italian Countryside dishes and I absolutely love them. I can’t wait to add to my collection. You’ve included so many pretty patterns in your collage. I love my white dishes! Thanks for showing how you mix and match! I love to use the white china that my mom gave me 40+ years ago when I married. It always makes me think of her when I set the table. Several years ago, my oldest daughter told me that she’d like to have the china when I’m gone so I guess I’m not the only one who enjoys it. 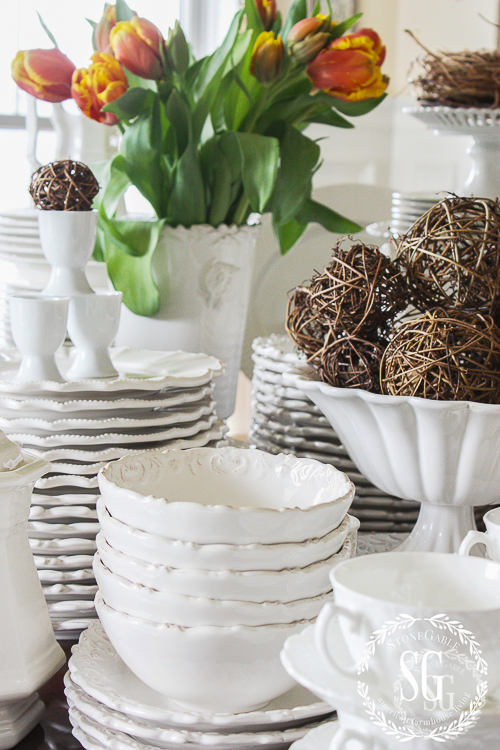 I am like a kid in a candy store when I find beautiful white dinnerware at a reasonable price. I like to buy patterned salad plates to complement the dishes. A beautifully set table sets the tone for a dinner party. I’m anxiously waiting to see what my sister has done for the Christmas dinner table. Thank you for all your inspiration throughout 2016. I’ll be reading your posts in 2017! Merry Christmas! Dishes are my weakness, I inevitably wind up in that section of whatever store I am in! I purchased 12 place settings in white on clearance at Dillards and it was the best decision. I had to go to several stores in 2 states to collect them all but So worth it. I use them everyday no matter the occasion. Thanks for sharing. My olde white ironstone dishes are my go-to’s and along with a set of red dishes, seem to combine for any occasion in mix and match ways. How my guests seem to love using my white ironstone butter pats and other odd pieces. Even odd ironstone lids are lovely in a wall grouping. White is the way to go !!!! White dishes are so perfect. I am building my collection so your advice is perfect timing. After finding your blog several years ago, I started to think about replacing my patterned dishes with white dishes. It took awhile to convince myself to buy white, but once I did, I never looked back. I never get tired of them like I did with my patterned dishes. I love white dishes as much now as I did when I married almost 52 years. I’ve tried other colors over the decades, but keep coming back. Now on my third set. Love dishes of all kinds, but especially all shades of white to mix and match with whatever I am trying to do on my table or whatever season. Think they make the table so pretty. I couldn’t agree more. 25 years ago I got a white set of depression era dishes for Christmas. So beautiful. I switched out to white dishes a couple of years ago and love them. I also have a love affair with white pitchers. I love to display flowers in them. I think I need to buy more dishes with different patterns to add interest to my table. I bought a set of Martha Stewart white dishes from Macy’s quite a few years ago. Due to lots of use there are scratches on the plates I believe from cutlery. Any ideas on how to remove the scratches? I like the idea of mixing it up with different patterns. Will start looking at Home Goods and Target for some great finds. I have white dishes too and I agree that never go out of style I also have my pitchers display above my cupboards in the kitchen. Thanks! 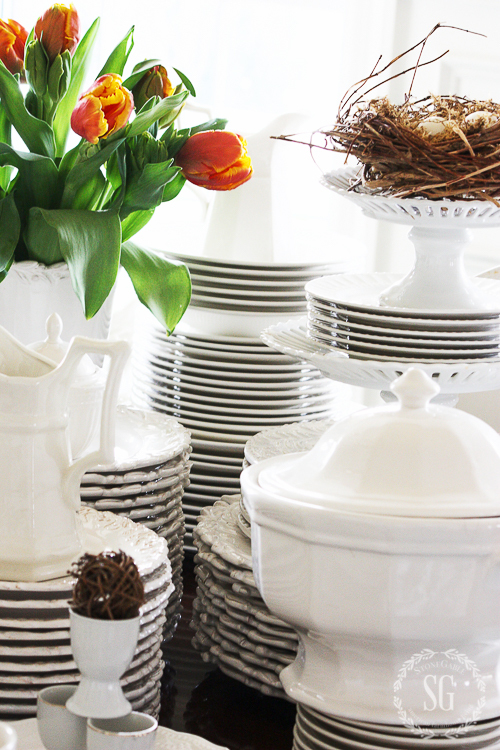 I have always loved and collected white dishes (in fact, I still have my first set and it still looks beautiful)! Oh I love white dishes too! They look great with my red and green dishes for Christmas and with my blue and white dishes as well. I guess I have a weakness for dishes of any kind. Love pretty tables! I hope my family will always remember my dining table. I love white dishes! They go with everything and white-on-white patterns can be mixed so beautifully as you have shown. But, most of all, I love the appearance of the food when plated on white dishes. No plate colors to distract from the beauty of the meal served. Have a blessed and healing Christmas. 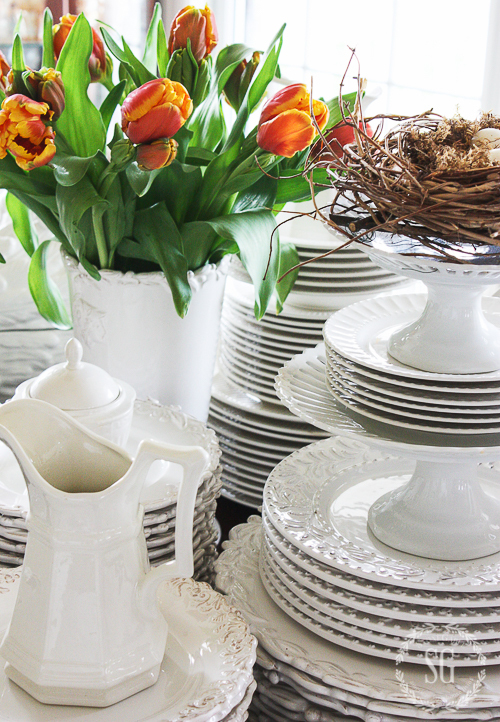 The first Stonegable post I saw several years ago was a spring cupboard filled with white dishes and white tulips. It was beautiful just like everything you do. I have been following you ever since. Always such great ideas. Merry Christmas. A great post. I collect white too. I’ve never bought patterned dishes. Love the clean look. Merry Christmas. Great year. Love my white dishes too!!! I have almost every piece of my Heritage pattern and have enjoyed them for more than twenty years. Merry Christmas to all. White dishes are my favorite! I hope your foot is healing quickly. Merry Christmas and Happy New Year! I have always had patterned dishes until recently. After following your blog and especially your article on white dishes, I am adding white dishes to my collection !!? You are spot on, they work perfectly with everything!! You can teach an “old dog” new tricks!! Thanks Yvonne, a woman can never have too many dishes!!! Love Love Love Dishes!! But white dishes are my absolute favorite! You have a gorgeous collection! Love white dishes, but I also love color so it is fun to mix them. I have several sets of dishes, two from relatives that I cherish. Have you noticed how much smaller the dinner plates used to be? What does that say about our society? What a beautiful collection! And a great idea! I agree completely. As a girl from the 60’s, I initially chose an orange and yellow flowered Noritake pattern. Mmm…it’s coming back around, hopefully. I also have woodland Spode that sets a beautiful Thanksgiving table. However, my favorite by far is my all-white set that goes from everyday use to a company dinner easily. White goes with everything like a string of pearls. I’ve never met a dish I didn’t like… white or otherwise! Love to set a pretty table. 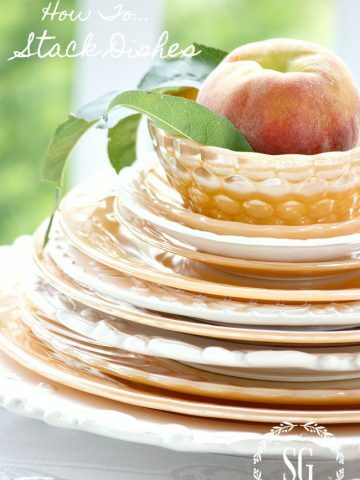 Even plain white Corning plates can be pretty dressed up! I love white too. However, I have quite a collection of white pitchers. For some reason I have to buy them. Perhaps in another post you can show us what to do with white pitchers! I have 3 sets of dishes…and use the white the most as they fit every occasion. You are so right about them. I will be looking for non matching pieces in the future and use them like you do. Thanks for a great post. Great idea, Kathy! Thanks! I have my pitchers displayed above my cupboards in the kitchen. I love white dishes, it’s what I have too! As far as mixing sets, does it bother you when the whites aren’t the same shade? Do you think it’s ok to mix the different shades of white? Robin, what a great question! It is PERFECTLY fine to mix different colors of white dishes as long as you do it around the table and not in just one or two spots. I think that looks so so beautiful. 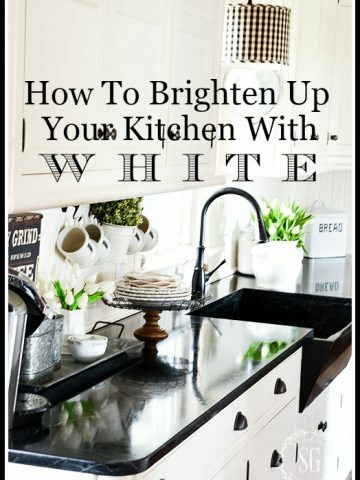 Here’s another tip: try mixing different colors of white dishes when stacking them. The effect is very beautiful! Love all the white dishes. I need to start collecting more. Merry Christmas to all. Merry Christmas. You inspire me to change things up. OMG! What a timy post! You just gave me the freedom from feeling guilty about the set of white dishes I ordered yesterday! I purchased Mikasa French Country white! I have always had white dishes then I thought I should switch to color but you can’t do with color what you do with white! And I too love mixing patterns of white! I am so excited! You definitely need white @ Christmas! Thank you! Merry Christmas! When I am grocery shopping in Target the dish area usually draws me in about once a month to check out their white dishes and at this time of the year some holiday accent dishes that will not be on sale. Such great ideas. Several years ago I replaced my 40 year old fine pattern china with two different sets of white dishes and haven’t looked back! When I have a large number of guests I just mix the patterns and no one notices. Really enjoying my white dishes. I agree 100%! I have been using my white dishes for over 30 years and I still love them! Basic white from Pier 1! Well, I know what to order my daughter for her March birthday now! What a wonderful collection. Merry Christmas! I completely agree with you!! I have the same love affair with white dishes. I display stacks and interesting arrangements behind my glass cabinets and sideboard. I cannot resist ruffle edged white dishes. Definitely a weakness of mine!! I’m always looking for more white dishes to add to my collection!! I have always had white dishes and love them – they are so versatile.